Margaret Morgan was born in freedom's shadow. Her parents were slaves of John Ashmore, a prosperous Maryland mill owner who freed many of his slaves in the last years of his life. Ashmore never laid claim to Margaret, who eventually married a free black man and moved to Pennsylvania. Then, John Ashmore's widow sent Edward Prigg to Pennsylvania to claim Margaret as a runaway. Prigg seized Margaret and her children—one of them born in Pennsylvania—and forcibly removed them to Maryland in violation of Pennsylvania law. In the ensuing uproar, Prigg was indicted for kidnapping under Pennsylvania's personal liberty law. Maryland, however, blocked his extradition, setting the stage for a remarkable Supreme Court case in 1842. In Prigg v. Pennsylvania, the Supreme Court considered more than just the fate of a single slavecatcher. The Court's majority struck down the free states' personal liberty laws and reaffirmed federal supremacy in determining the procedures for fugitive slave rendition. H. Robert Baker has written the first and only book-length treatment of this landmark case that became a pivot point for antebellum politics and law some fifteen years before Dred Scott. Baker addresses the Constitution's ambivalence regarding slavery and freedom. At issue were the reach of slaveholders' property rights into the free states, the rights of free blacks, and the relative powers of the federal and state governments. 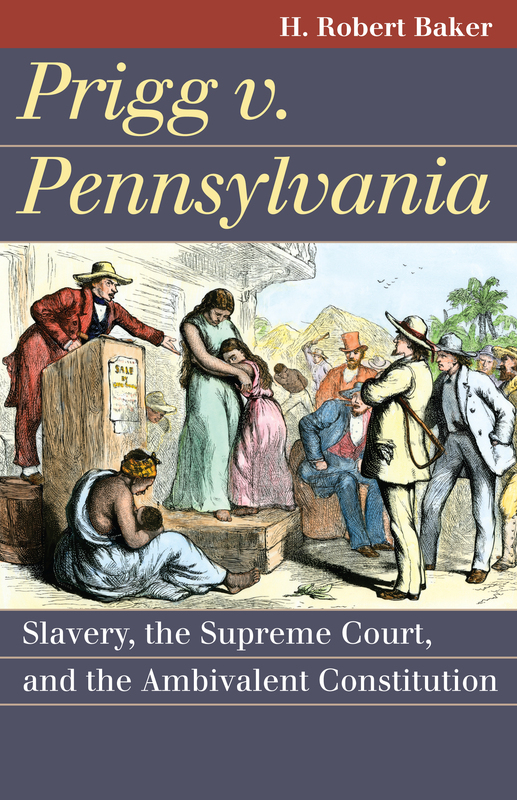 By announcing federal supremacy in regulating fugitive slave rendition, Prigg v. Pennsylvania was meant to bolster what slaveholders claimed as a constitutional right. But the decision cast into doubt the ability of free states to define freedom and to protect their free black populations from kidnapping. Baker's eye-opening account raises crucial questions about the place of slavery in the Constitution and the role of the courts in protecting it in antebellum America. More than that, it demonstrates how judges fashion conflicting constitutional interpretations from the same sources of law. Ultimately, it offers an instructive look at how constitutional interpretation that claims to be faithful to neutral legal principles and a definitive original meaning is nonetheless freighted with contemporary politics and morality. Prigg v. Pennsylvania is a sobering lesson for those concerned with today's controversial issues, as states seek to supplement and preempt federal immigration law or to overturn Roe v. Wade. H. Robert Baker is an associate professor of history at Georgia State University and author of The Rescue of Joshua Glover: A Fugitive Slave, the Constitution, and the Coming of the Civil War.